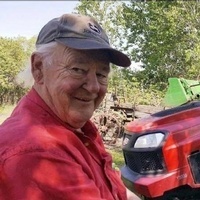 Arden DuChamp, 80 of Thief River Falls, MN passed away on Tuesday, June 26, 2018 at Sanford Medical Center in Fargo, ND surrounded by his loving family. The last voice he heard was his Granddaughter Ashlyn singing “In The Garden” to him. Funeral Service will be held at 10:30 AM on Monday, July 9, 2018 at Silver Creek Lutheran Church, rural Thief River Falls, MN. Visitation will be held one hour prior to the services. Burial will follow at Silver Creek Cemetery, rural Thief River Falls. Joseph Arden DuChamp III was born on Wednesday, September 1, 1937, in Thief River Falls, MN. He was the 5th child born to Joseph Arden and Alice (Hanson) DuChamp. He was born at home at 501 Kendall Avenue South. He was named after his father and the Ardennes Forest in France, which is known for its rugged terrain, meandering rivers and dense forests. Arden was raised, baptized and confirmed in the Methodist Church in Thief River Falls. When Arden was four years old, his mother Alice died from tuberculosis. His father eventually remarried the most kind, caring, loving person, Hazel Adolphson who raised Arden as her son. He attended Knox School and graduated from Lincoln High School in 1956. As a young man he helped his dad and brother build the house at 802 Kendall Avenue South. After his high school graduation he attended the AVTI, taking electronics classes. Before pursuing his electronics career with Owens Electric, he was TV repair man. On November 3, 1956, Arden married Darlene Sampson, at the Methodist Church Parsonage in Thief River Falls, MN. The couple lived in Thief River Falls before moving to the Minneapolis area in the mid-1960’s. After Arden became sick with Rheumatic Fever, the family returned to Thief River Falls and built their own home in Adger Township in Marshall County. Arden established DuChamp’s Electric in Thief River Falls which kept him busy while his wife Darlene did the book work for the business. In 1982, they moved back to and worked in Minneapolis. While in Minneapolis he worked alongside of his sister, Ione at the Buckingham doing whatever needed to be done, a jack of all trades you might say. In 2002 they returned to their home in Marshall County, retiring from DuChamp Electric in 2016. Back in the day he was an avid archer. He was joined by many others from this community in the 1960’s organizing the Archery Range. The outdoor area included many ranges for bow hunters with different distances. The Club provided a place for people, individuals and families, to enjoy archery, develop friendships, and promote the sport of archery. He also enjoyed a good game of bowling at the Family Bowl. There wasn’t a wood project that he couldn’t do once he made up his mind. His last project was an old fashioned outhouse located by the family garden. On occasion Arden would try his hand at mechanics. He was always up for the challenge of putting it together his way whether there were parts left over or not. Arden enjoyed spending time at the Fourtown cabin hunting or farming. He liked to watch a good Vikings game. He was always ready for a game of cards and a story or two with his granddaughters, family and friends. He is survived by three children, Joleen Stine, Deanna DuChamp, and Joseph DuChamp, all of Thief River Falls, MN; grandchildren, Ashlyn, Jasmyn, Denise, Amy and special granddaughter, Rachel; sister, Naida (Jack) Pederson of St. Cloud, MN; brother, Mark (Judy) DuChamp of Thief River Falls, MN; sisters-in-law, Harriet Phillip of Thief River Falls, MN, Arlene (David) Mueller of Lake Minnetonka, MN, Peggy DuChamp of Lake George, Michigan, and Holly (Jim) Drouillard of Trail, MN; brother-in-law, Sam Siegel of Golden Valley, MN and many nieces, nephews, family and friends. He is preceded in death by his wife Darlene, his parents, Joseph, Alice and Hazel; sisters, Ione Siegel and Joan Engelstad; brother, Duane DuChamp; brothers-in-law, Harry Phillip and Don Engelstad; and sister-in-law, Geraldine Sollom.